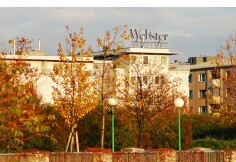 In Kürze wird sich die zuständige Kontaktperson des Anbieters Webster University Vienna mit Ihnen in Kontakt setzen um Sie bestmöglichst zu informieren. In addition to the business core curriculum, B.S. in business administration students will select three courses (9 credits) from BUSN, MNGT or COSC courses. *NOTE: Students majoring in the Bachelor of Science in Business Administration can apply the following departmental courses to the nine courses (27 credits required for general education : BUSN 2750-Business Statistics (Area 8 – Scientific Understanding) and MATH 1430-College Algebra (Area 9-Mathematics). **The substitution of MNGT 3320-Business Law International for MNGT 3310-Legal Environment of Business has been approved. MNGT 3290 is a prerequisite for MNGT 3320-Business Law International. A student can major in the BSBA and a Management Area without substituting courses for ACCT 2020, ACCT 2025, ECON 2010, ECON 2020, and MNGT 2100, which reduces the requirement for the second major by 15 hours. However, substitutions will be required for courses required by both majors that are not on this list.